My name is Giselle, I'm 30 years old and I'm from Sydney. Giselle Stanbra, nice 2 meet ya! I'm single, but I'm undecided as to what this means culturally and existentially. I'm also an artist, and I made this website to combine my love of contemporary art with my passion for meeting new people and making amazing connections! I am interested in art because it has the ability to offer a counter-argument to an individual's innate solipsism. Art allows an imaginative connection to the realities experienced and articulated by a consciousness other than one's own. An apparition of consciousness conjured in an art gallery. This sense of affinity is not only experienced by the individual audience member as an isolated encounter with an artwork, but through the broader interpretations and identifications initiated and sustained by conversations with other audience members. Basically, I think that art does have a functionality: that of overcoming existential loneliness, which for me is experienced as a kind of single status of the soul. I have made this project with the intention of applying that functionality to one of the most contentious yet omnipresent and normative contexts of interpersonal relations: dating. Specifically, Internet dating. More specifically, Internet dating me. My Tinder profile, pic taken in front of "It's All Your Fault Mum" by Paul Yore, 2016. Tinder possesses the largest pool of potential matches, with 15% of Australians using the app. My Bumble profile, pic taken in front of "Clockwork for Oracles" by Ugo Rondinone, 2011 and with "White Styrofoam on Black Wall" by Sol LeWitt, 1994 in the background. Bumble has earned the epithet 'feminist Tinder' because only women can begin a chat. My Happn profile, pic taken in front of "Coming Soon - The Last Evil" by Tianzhou Chen, 2015. Happn monitors your geolocation to match you with users that you have physically crossed paths with. My Skout profile, pic taken in front of "HOME TOWN Dawn" by Heath Franco, 2016. Unlike Tinder, Scout allows fellow users to start a chat whether or not you have liked them. My Hinge profile, pic taken in front of "Teena's Bathtime" by David Capra, 2015. On Hinge, suggested matches must have at least one Facebook friend in common. 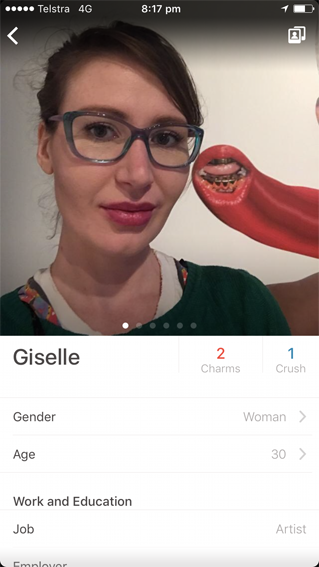 My Coffee Meets Bagel profile, pic taken in front of "I'm A Bit Partied Out Pam" by Rosie Deacon, 2015. Coffee Meets Bagel is based around what it calls '#ladieschoice': women select matches from a pool of male users who have already liked them. My Fortu profile, pic taken in front of "Kanpaarka (centipede) Tjukurrpa" by Long Tom Tjapanangka, 1994. Fortu emphasises the date activity rather than the user profiles. Anyone can post a date suggestion to which other users can respond and join. My "Hey! VINA" profile, pic taken in front of "Plate Pole Prop" by Richard Serra, 1969/1983. Hey!VINA is networking app for women. While not technically a dating service, I include Hey!VINA to diversify the audience for Giselle Dates and expand the kinds of social engagement that the work can accommodate. I have made a little art intervention to this end here, and I will be repurposing the exhibition "Unfinished Business" as a place for me to go on dates with people that I have met through pre-existing geo-social dating apps (specifically Tinder, Happn, Hinge, Coffee Meets Bagel, Scout, Bumble, Fortu and Hey!VINA). If you don't use Internet dating services, you can also organise to date me through this site, just click the Meet Me link.